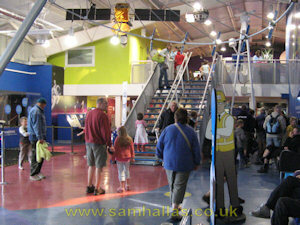 Sadly the Goonhilly Future World and Visitor Centre closed early in 2010. A sad blow for the local tourist industry as it had clocked up around 80,000 visitors a year. A BT spokesperson said at the time "BT is currently looking at the future of the assets at Goonhilly, including the Goonhilly Visitors' Centre and is discussing options with other organisations." In January 2011 it was announced that the former Satellite Earth Station was set to be upgraded and redeveloped by a consortium, "for use at the forefront of world-leading radio astronomy projects and Deep Space Network communications." 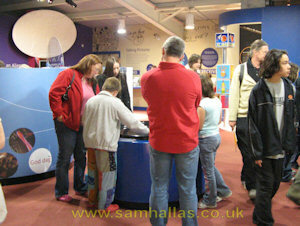 It was said that there are also plans to redevelop the visitors centre into a new space-themed outreach centre. 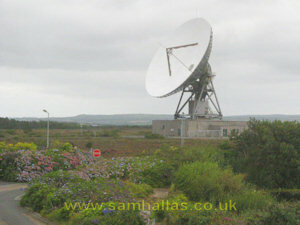 In December 2011 Deputy Prime Minister, Nick Clegg, announced a grant of £6.85m from the Regional Growth Fund (RGF) to Goonhilly Earth Station (GES) Ltd. Adviser to GES, Des Prouse, said, "This is the start of establishing the Goonhilly Space Science Park comprising a space-communications gateway, an open innovation centre, a training establishment and a revitalised, space-themed visitor centre." At the same time the Western Morning News announced, "a further £5 million will go to another company at Goonhilly - Avanti Communications Group - for the creation of a "broadband satellite teleport", using satellites to carry broadband internet signals. It launched its first satellite last year and is planning a second in 2012." I visited BT's Goonhilly satellite earth station in August 2007. The weather was more like November than August as you will see from the pictures. Later in the day the sun came out and I took this picture of Goonhilly's dishes in the distance from the road down to the Lizard Point. 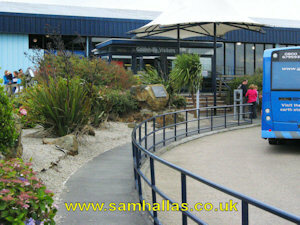 Outside the entrance to the visitor centre were coaches to take us on a tour round the site to see the many dishes. The entrance and car park are presided over by Arthur, the original dish on the site. Arthur was constructed in 1962 to work with the fast-orbiting Telstar satellite and for that reason is the most agile of Goonhilly's dishes. Arthur is now a Grade II listed structure. The item in the foreground is a 'petal' similar to the segments in the main dish. The visitor centre was welcoming with lots of displays with an educational slant for the younger visitor. 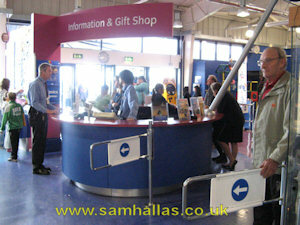 In its last full year of operation it had attracted more than 100,000 visitors, according to BT. 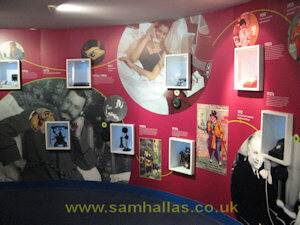 Displays were on two floors. This picture shows the staircase leading to the upper display area with models of satellites hanging down. Of course, the technology heritage on display at Goonhilly was a lot newer than most of the other Connected Earth sites. 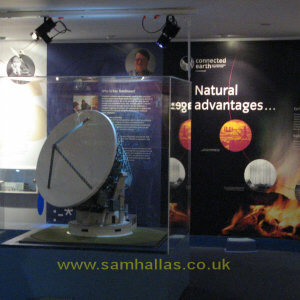 The key theme of the displays was satellite technology. Here the basic principles were explained. At this console visitors could steer a dish on the roof to connect with one of several geostationary satellites and view the TV channels they were transmitting. The Connected Earth display showed the history of telecommunications with various artefacts in small windows. This part was about telephony. 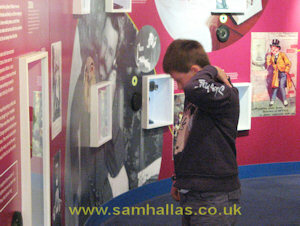 Some of the young visitors were obviously interested in old phones. 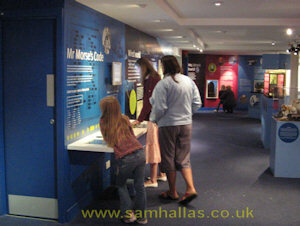 Here's a display about telegraphy, starting with Morse code. Goonhilly was also a terminal for several undersea fibre optic and coaxial cbales. 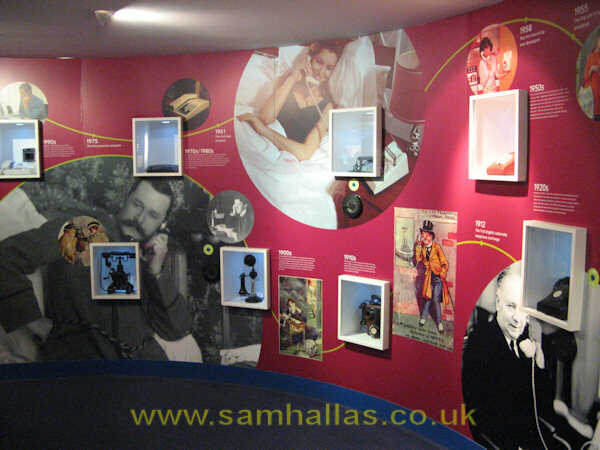 Some samples of such cables can be seen in the display case. 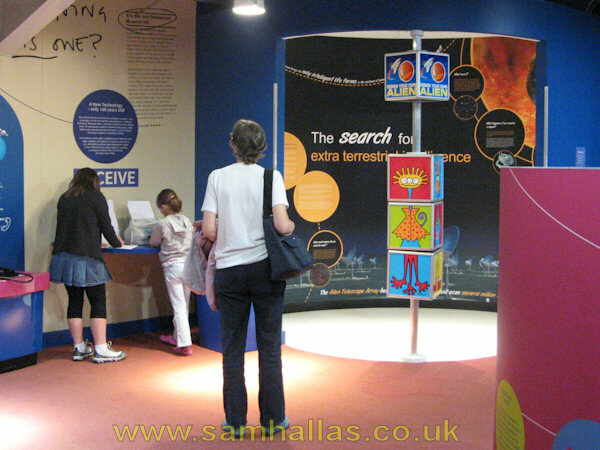 A rather fanciful display about the search for extra-terrestrial intelligence. 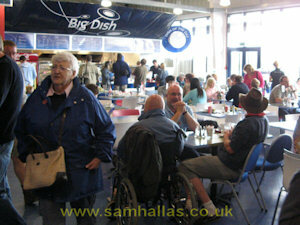 The coach tour took visitors round the site to see the control tower and many of the other dishes on site. 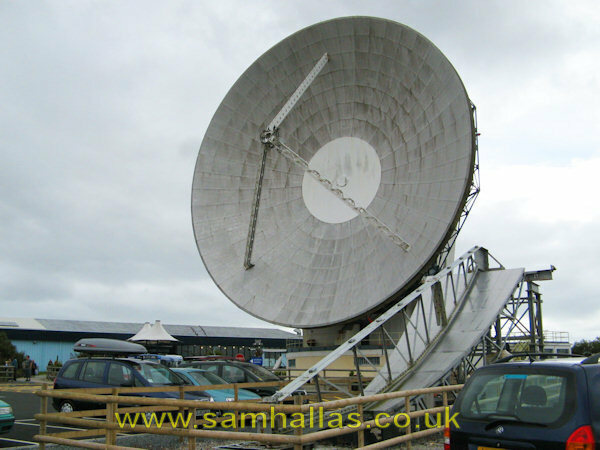 BT has scaled down operations at Goonhilly and many dishes were expected to disappear. It was thought that eventually only Arthur would remain. The plans of the new consortium mean that many more of the dishes may be retained for space exploration purposes. The centre had an internet café with high speed connections much faster even than home broadband. However these two did't look terribly impressed. The café was pretty busy. Maybe it was a reflection of the poor weather outside. Appropriately enough it was called the Big Dish. Probably not a reflection on the size of portions. 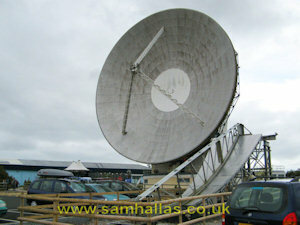 Collection: BT Goonhilly. 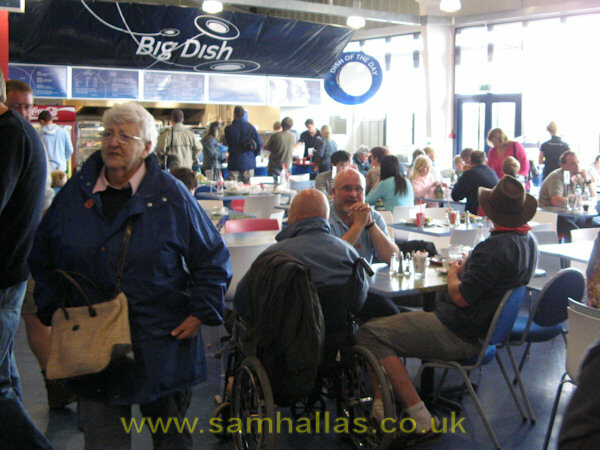 Pictures © 2007, text © 2008 & 2011 Sam Hallas.